Teaches accounting methods and knowledge of product specifications necessary for successful foodservice operation. In this time of high costs, administrators are looking at every possible way to economize without adversely affecting foodservice quality and the welfare of those served. Purchasing techniques can be very useful in maximizing the resources of the dietary department. This book will assist you in learning accounting procedures and product specifications that will be needed by the competent purchaser in performing the duties necessary to provide optimum purchasing decisions basic to a successful foodservice operation. The foods included are those used in most foodservice departments. No attempt has been made to cover all foods available. Useful for any level - written to be understood by all. The book has been organized to simplify a rather complex subject. It is hoped that this information will serve as a tool for making improvements in the purchasing function of foodservice departments. 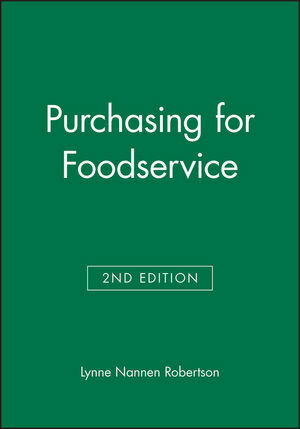 Lynne Nannen Robertson is the author of Purchasing for Foodservice, 2nd Edition, published by Wiley. Preface; The Philosophy of Purchasing; Accounting Procedure; Beef; Pork; Lamb; Seafood; Poultry; Eggs; Dairy Products and Alternatives; Cheese; Fresh Fruits; Fresh Vegetables; Canned, Frozen, and Dried Fruits and Vegetables; Cereal Products; Spices, Herbs and Flavorings; Sweetening Agents; Beverages; Receiving and Storage, Index.